Fusion dance lessons encompass a variety of styles of dance including: jazz, theatre dance, lyrical jazz, contemporary and street dance. The class starts with a warm-up including low intensity cardiovascular work-out, stretching to encourage flexibility, exercises to increase core strength, and some basic ballet technique to improve controlled dance movements and alignment. Choreographed dance routine: over time you will learn a variety of dance numbers from commercial jazz, theatre jazz, Broadway and lyrical. Music: from Pop music, R&B, Jazz and Musical Theatre. It's a sociable class and many students have made friends through coming to the class, we sometimes go for a drink, have a meal out and theatre trips can be organized - all optional of course. 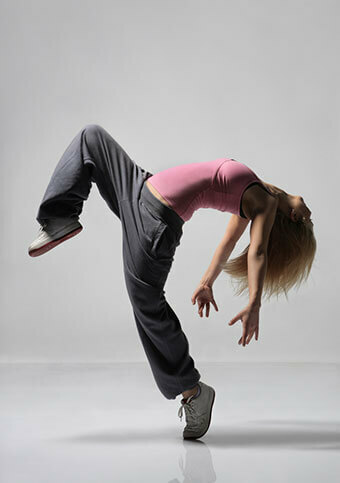 Jazz dance shoes are the best but trainers are fine, something you can move easily in, jogging bottoms and T shirts. Bring a friend (not compulsory!) and a bottle of water. Our classes are held at the Yorkshire Dance Centre, 3 St Peter's Buildings, St Peter's Square, Leeds LS9 8AH. For further information about our classes, please call Sarah for details: 07961 579482. Standard: Classes are suitable for beginners. Location: Yorkshire Dance Centre, 3 St Peter's Buildings, St Peter's Square, Leeds LS9 8AH.